A sector comprises 20% of a circle. What is the central angle of the sector? Proporations can be used to solve for the central angle. Let equal the angle of the sector. Find the degree measure of . Since and form a linear pair, , and . Two pizzas are made to the same dimensions. The only difference is that Pizza 1 is cut into pieces at 30° angles and Pizza 2 is cut at 45° angles. They are sold by the piece, the first for $1.95 per slice and the second for $2.25 per slice. What is the difference in total revenue between Pizza 2 and Pizza 1? In order to find the percentage of a sector from an angle, you need to know that a full circle is . 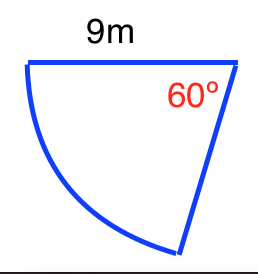 A sector of a circle contains a center angle that is 36 degrees. What percentage of the circle is the sector? Proportions can be used to determine the percentage. Let equal the percentage comprised of the sector. A circular, 8-slice pizza is placed in a square box that has dimensions four inches larger than the diameter of the pizza. If the box covers a surface area of 256 in2, what is the surface area of one piece of pizza? The first thing to do is calculate the dimensions of the pizza box. Based on our data, we know 256 = s2. Solving for s (by taking the square root of both sides), we get 16 = s (or s = 16). Now, we know that the diameter of the pizza is four inches less than 16 inches. That is, it is 12 inches. Be careful! The area of the circle is given in terms of radius, which is half the diameter, or 6 inches. Therefore, the area of the pizza is π * 62 = 36π in2. If the pizza is 8-slices, one slice is equal to 1/8 of the total pizza or (36π)/8 = 4.5π in2. 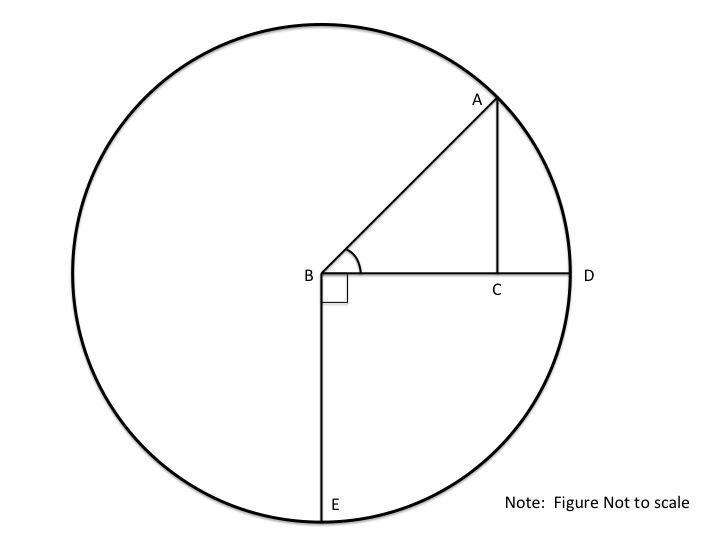 If B is a circle with line AC = 12 and line BC = 16, then what is the area formed by DBE? To the nearest tenth, give the area of a sector of a circle with diameter 18 centimeters. Find the area of a sector that has an angle of 120 degrees and radius of 3. The equation to find the area of a sector is . What is the area of the following sector of a full circle? Note: Figure is not drawn to scale. In order to find the fraction of a sector from an angle, you need to know that a full circle is . where is the radius of the circle.